published in Harper's Weekly, January 1879. In the December 11, 1890 edition of The Standard, a weekly Concord newspaper, local drug store owner and operator J. P. Gibson ran an eye-catching Christmas advertisement. This ad featured a letter from Santa Claus, disputing rumors that Christmas would be postponed because 1890 cotton prices were low. St. Nick also advised Cabarrus County children to write their letters to him in care of Gibson, whom he appointed his sole agent for the county. Dr. John Phifer Gibson was born in 1839 in Cabarrus County, son of Edmund L. Gibson and Elizabeth Phifer Gibson. He attended Davidson College and graduated from UNC in 1858 and was enlisted as a physician in Company B, North Carolina 20th Infantry, during the Civil War. Dr. Gibson was married to Martha "Mattie"Kirkpatrick. After the war, he continued to practice medicine and then opened a drug store. His first store was called Caton's Corner; later the store became known as Gibson's Drug Store, located on the Square in downtown Concord. Dr. Gibson's unusual and elaborate newspaper ad is reproduced here. Biographical information on John Phifer Gibson can be found in Early Medicine in Cabarrus, edited by Jane Harris Nierenberg, located in the Concord Library's Lore Local History Room. Some enemy of mine (I didn't know before that I had an enemy in the word) has been circulating the report that owing to the low price of cotton, Christmas had been postponed till next year. Now, little folks, listen to no such silly palaver! Hang up your stockings and put your trust in a kind Providence and your old friend, Kris Kringle. The desire of my heart is to make you all happy, and many a night, during the past year, when you were curled up in bed, sleeping like so many little turtles on their logs on a summer day, the peep of dawn has seen me hard at work, making playthings for my beloved children. 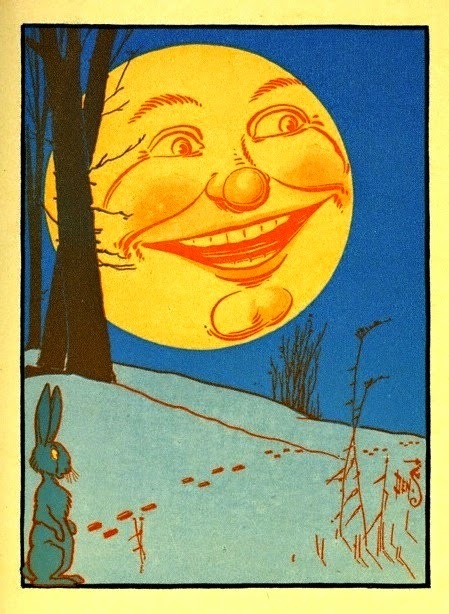 Moore, illustrated by W. W.
I also had a letter from your old friend and admirer, "The Man in the Moon," a day or two ago, in which he tells me that he has just sent to headquarters a petition to be allowed to shine every night of the year till twelve o'clock and then to have the rest of the night to himself. As it is now, he is on duty, some nights, only part of the night, some, all night, and some, not at all. I think it is a capital idea, and hope his petition will be granted. Write your letters in the care of Dr. GIBSON, my sole agent for your county, keep your toes warm and your heads cool and don't forget your best friend, SANTA CLAUS. Having been delegated by Santa Claus as his sole agent for this county, as the trout said to the fly as he took him in out of the wet, "I always rise to the occasion," and hereby accept said appointment with thanks. My stock of Christmas Goods, comprising hundreds of beautiful things in china and glass, thousands of dolls, a large and varied assortment of toys, musical instruments, pictures, frames, baskets, plush and leather toilet sets for ladies and gentlemen, writing desks, writing tablets, albums, walking canes, etc., etc., is so great that I am running two stores this season - one at Gibson's drug store and the other in the room adjacent, on the south side. My business has developed so much, thanks to the kind patronage of a generous public, that I will in the future occupy two rooms, instead of one, as heretofore. After the 1st of January next I will "hold forth" in the Caton building, occupying both rooms. In the meantime if you will call at the Phifer building I honestly believe you will find there everything you may want in the way of Christmas Goods. This image was shot from the square in Concord, looking south down Union Street, sometime after the 1965 renaming and renumbering of Concord streets. The Gibson Drug Store (far left) was still in business on the corner of Union Street and Cabarrus Ave. (current location of Chocolatier Barrucand). Photo courtesy of Jim Ramseur/Independent Tribune. City directories are a valuable resource when researching the businesses your ancestors may have owned or frequented. They also are helpful in creating a timeline for understanding when new innovations in business and industry entered the community. Such is the case for the automobile. As the home of the Charlotte Motor Speedway, Cabarrus County has a strong tradition of automobile racing and its related industries. However, as the directories show, Cabarrus was not always an "auto driven" county. The birth of the automobile industry is recognized as beginning about 1885 when the first successful gasoline engines were built in Europe. The first U.S. gasoline powered car appeared in 1893. Utilizing mass production by 1901, the U.S. auto industry quickly became dominant, and it was Henry Ford's assembly line production, begun in 1913, that had the greatest impact on this rapidly growing industry. in the 1913-1914 Concord City Directory. The 1908-1909 Concord City Directory listed two hardware companies in town, Ritchie Hardware and Yorke & Wadsworth, which sold "vehicles," most likely wagons and buggies. There were eight livery stables, including M. L. Brown & Brother, Corl-Wadsworth, Henry & Cline, and Penninger Brothers. In the 1913-1914 directory, Concord boasted only one automobile dealership, Cabarrus Motor Company. There were still listings for six livery stables and numerous other buggy and wagon related businesses, like blacksmiths E. C. Turner and J. F. Dorton and wagon repairer W. D. Harris. 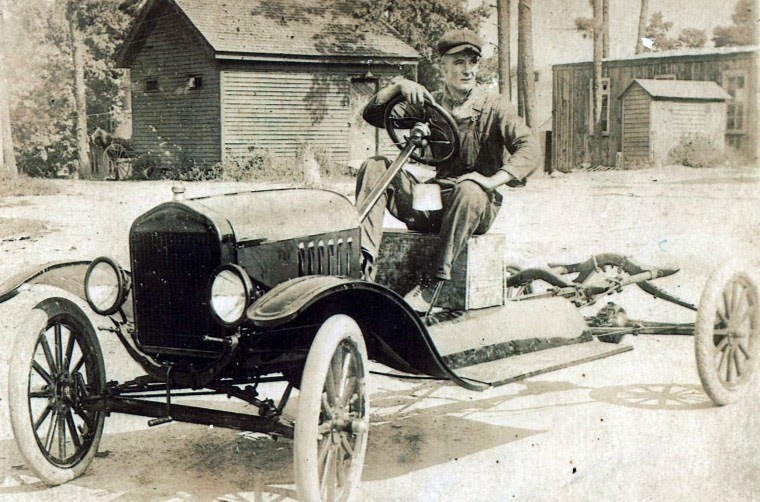 By December 1, 1924, the 1925 North Carolina Yearbook showed that Cabarrus County had 4,236 registered automobiles. With a 1920 population of 33,730 people, that averaged one car per every 7.9 persons. Yet those 4,236 cars were beginning to have an impact on the county. The 1924-1925 Concord City Directory listed two columns of automobile related businesses, including Auto Supply & Repair Company, Forest Hill Service Station, McDonal Filling Station and Southern Motor Service. Those and other Concord businesses supplied local drivers with battery service, gasoline and tires. There were eight garages, and Howard's Filling Station on East Depot Street (now Cabarrus Ave.) at Church Street, even advertised "washing and polishing." None of the 1914 livery stables remained, although some former livery owners appear to have moved with the times and gone into auto-related businesses. Although Charlotte Motor Speedway and race-related businesses were still yet to come, Cabarrus County was on the automobile track with the rest of the country. City directories and yearbooks are available at the Concord Library, Lore Local History Room.